Marketing Tips 4 Authors - by Clive Eaton: Do cost per click promotions work for authors? The answer to this question is a simple case of mathematics, and considering a ‘conversion funnel’. For many years I worked as a Dealer Principal in the automotive retail sector. Based on the performance of the sales staff, I knew how many people, on average, they would need to speak to, to make one sale. We constantly measured conversion rates. How many people who test drove a car would buy one? How many visitors to the showroom would take a test drive? How many people who rang in making any enquiry would make an appointment to visit the showroom, etc etc. 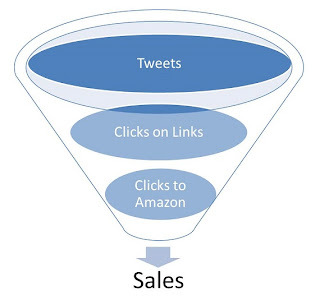 Below is a conversion funnel relating to online book sales. Let’s create a scenario, relating to the promotion of books, using the above conversion funnel. We’ll say you’ve been approached by an online company who want to promote your book on their website. They state you’ll only get charged if a visitor ‘clicks’ on your link/advert on their site, and they want to charge 10 cents per click. We need to make another assumption – the royalty you receive from the sale of your book. If using the Amazon 70% royalty scheme it could be two or three dollars. Let’s be reasonably ambitious and say $2.50. In our scenario that $2.50 will pay for 25 clicks. If 20%, who click on the link, buy your book, that will provide five sales. So that’s $2.50 out, to get $12.50 in. That’s a pretty good return on investment in anyone’s eyes. But wait a minute. How realistic is it that 20% will make a purchase? We can examine the question by developing the scenario further. The company approaching you has, say, an impressive 100,000 Twitter followers, and use Twitter to promote their service . . . and your book. The first thing to consider is how many followers actually visit the site, and how many of these visitors are unique? This is the first question to ask the promoter. That 100,000 audience will drop dramatically in terms of active clicks. Let’s be generous and say 10% do. So now the site has 10,000 visitors. What percentage will click on YOUR link? This could be 5%, or in other words 500 people (That would be a high percentage considering all the books being promoted on the site). If you are being charged 10 cents per click, those clicks have just cost you $50. You now need to make 20 sales to cover your costs. OK, so we now have 500 viewers looking at your promotional page on this particular site, with a link to Amazon. How many will click the Amazon link? 10%? If we are lucky. So now we have 50 visitors on the Amazon site. Yikes, you need 40% to buy the book just to achieve breakeven. What sorts of numbers convert to sales on Amazon? Sadly it’s a lot lower than that, and when I say a lot lower, I mean something in the region of 0.1%. Some items will convert higher, and some will be lower, but when I looked at a recent sample of 160,000 visits, across a selection of e-books, it wasn’t far from 0.1% in terms of those actually making a purchase. I’m now going to turn the numbers on their head, using a 0.1% Amazon conversion. I think I’ve been exceptionally generous with all the previous conversions, but I’ll stick with them for the point of this exercise. To make one sale, you’ll need 1000 visitors to your book’s page on Amazon. If 10% clicked on the Amazon link on your promotion page, you’ll need 10,000 visitors to that page . . . to make one sale . . . and earn $2.50 in royalties. If those 10,000 visitors to your page came from a conversion of 5% visiting the website promoting your book, then the website will need to have 200,000 visitors, and if they arrived at the site due to 10% of all Twitter followers reaching the site, then this particular company need 2 million followers – not 100,000. If you think that’s bad news, remember you’ve had 10,000 visit your page on the promotional website, at 10 cents a click. That $2.50 sale has cost you $1,000. I accept all the figures here are hypothetical, but one of the biggest mistakes people make in business is vastly overestimating conversion rates. I’ve seen it time and time again when looking at budgets and business plans. The only person who is going to win in the above scenario is the guy charging 10 cents per click. I've been wondering how cost effective those sites really are--thanks for answering my question! How good is Facebook's "promote' feature in comparison to a twitter site that promotes books? Interesting post, as I too have wondered about marketing on FB or Goodreads with this method. My budget is small so I won't bother. Thanks for this. This is very true... However, the pay-per-click sites are still more effective than the pay-per-view ones. The people who click are genuinely interested, whereas the ones who get an ad on their screen mostly ignore it. People who are new to advertising assume that they'll recoup the invested money with immediate sales, and make an instant profit. Neither is the case. If you buy advertising in the expectation of selling more books, take a deep breath and prepare for the reality shock. I agree with your comments, Rayne, about helping to sell future books, and hopefully lift the book up lists etc. But so many of these online advertising 'opportunities' are only opportunities for advertisers to make money, not authors. I was recently approach by a company offering me an advertising 'opportunity' to 125,000 potential readers. Even if they ALL clicked on the Amazon link within the advert, with current Amazon 'clicks per sale'conversion rates the cost of the adverts would still not be covered. In reality I'd be surprised if more than 1 or 2 percent would actually click the link in the advert. It is very easy to spend money on advertising in the vain hope that sales will follow. There are many free methods to create great exposure. Clive, this was one of the most useful posts re marketing I've come across. I've always been sceptical about the impact of posting anything anywhere, but of course we have to do something to get noticed otherwise we won't sell anything. I'm not good at doing sums and you have made the numbers involved very clear. Thank you. Clive, another wonderful post. Thank you. The schema you used is similar to those I've seen in other industries about the effectiveness of advertising dollars. Strong branding enhances the sell-through rate, but not significantly during the early stages of a career. Sad but useful. Hi I AM the author of the book called Help Me To Live Right By Kenneth Mitchell. I have the message in the book, God said read it first and read the book with an open mind and Heart, and read book all the way thru. Thanks for this article on PPC, it's very helpful. I was looking for a place to learn more about PPC, as I was thinking about implicating it into my business. But this article answered all of my questions and I'm very appreciative of it. And that is how I feel about these book adds. Wish I knew the answer because my books all slowed after awhile. But luckily, two of my short stories had short-film offers...and are in production at present. It's one way to go.I'm excited to have attracted the right people in film industry. But my books went from #2 in Germany and #9 in US to few sales the past months. The only answer seems to be what it has always been (before digital), get a good agent with NY publisher contacts and work hard to make it happen. What is your answer, Clive? I am sharing this with friends who need to wake up too. I often receive the 'free'Google Ad' card to promote my site, but of course after the first 25 pounds worth we have to start paying out for the clicks, I definitely don't earn enough or have enough followers to make it pay! lol!